Ducks made $115M, spent $95M, still won’t pay for Jock Box? 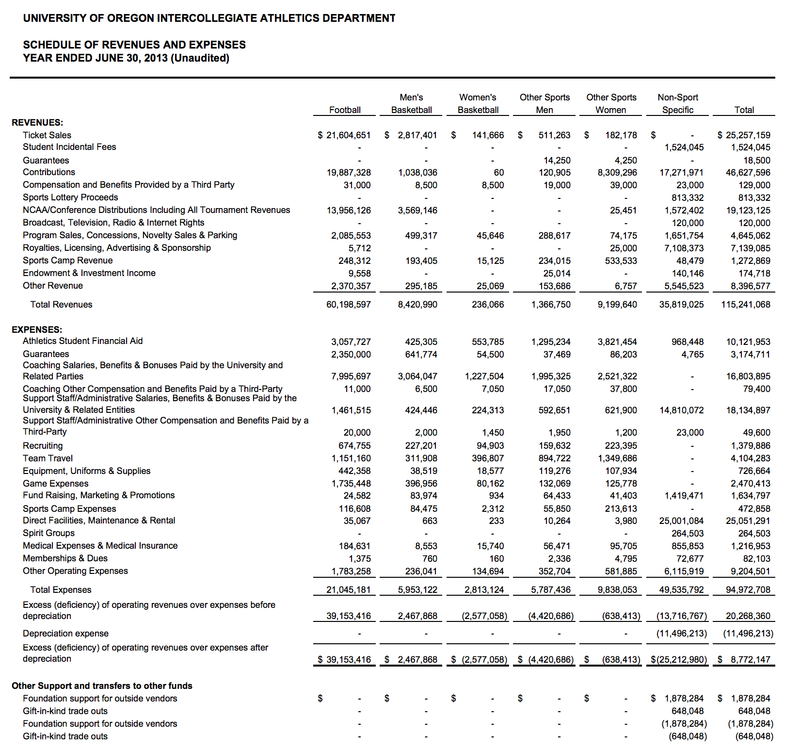 Athletic Department salaries now total $35M, versus roughly $70M for all UO tenure track faculty. Looks like the UO Foundation is laundering $47M of Duck Athletic Foundation money. All to promote UO’s academic mission, I’m sure. Tagged athletics subsidy, UO Foundation. Bookmark the permalink. 5 Responses to Ducks made $115M, spent $95M, still won’t pay for Jock Box? Student incidental fees just cover the medical expenses for the entire department. “We did not recalculate direct institutional support totals as none were reported in the Schedule” –> so CAS subsidies weren’t evaluated. Compared to FY 2011, revenues then were $86m… a nice 34% increase in two years. Balanced between ticket sales, 3rd party revenues, and NCAA revenue. Surprisingly, about the only expense that changed significantly was “direct facilities”, up $15m — probably thanks to shadow groups like Phit, LLC. Coaching, support, and student financial aid didn’t change much. Do the expenses include payments on the arena bonds? If not, the revenue/expenses talley gives a very incomplete picture. Uncle Bernie transparency would be nice wouldn’ it. The things that jump out here are the expense direct facilities maintenance and rental at $25M, University and related entities for $15M, and $6M for other expenses a total of $46 million or over 90% of the $50 million in expenses. Also, assuming the $46 million in contributions is the foundation, which I do not know if it is, why would the foundation kick in an operating profit? and how does this square with that other story about the foundation audit? Has the IAC seen this? Any comments from them? It seems like some combination of the senate budget committee, a subcommittee thereof, or the IAC (or a subcommittee of it) would look into this each year. It is not beyond human explanation (in the budget presented by the AD) or understanding (by the appropriate UO committee members).